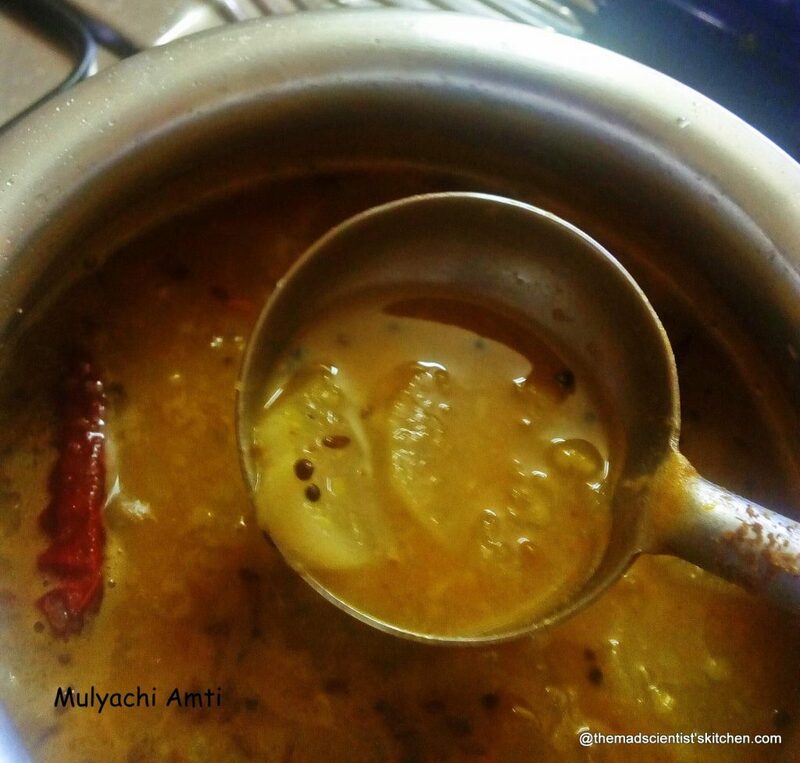 Mulayachi Amti or Radish with Dal Recipe is a delicious dal that I have eaten on to coming to Goa! I find it easy to feed my kids the much hated but healthy radish, Perfect for Protein Rich Diet! The only way my kids eat radish is Mooli ka paratha. Okay, I have hoodwinked them into eating pulao they did not know it was made from radish leaves. But generally, they do not enjoy the vegetable or even the salad that is just raita. Even in the dal, I mash some of the boiled radishes with the immersion mixer. This dal is very flavorful and tastes best with rice. To make this dal I have used Toor dal. I realise that I generally prefer toor dal to any other dal maybe because I grew up with this dal. The only other dal Amma used was chilke wali moong dal for khicidi or yellow moong dal for Moong dal payasa. It is only now that I have consciously started using other dals. Anyway, let us get down to making Mulaychi Amti with the delicious Mulo that is grown in the Goan fields. The Goans make yummy vegetable too with the tender roots and leaves. But that I will write about some other time. To make Mulyachi Amti your main ingredients are toor dal and radish. The other food that I have tried in the past with radish are Radish Leaves Pulao BM #13, Day 2, Mulangi Chutney or Radish Chutney, Mooli ke Parathe/ Radish Paratha Indian Flat Bread. Hmm, Mulya chi bhaji, pachdi, radish kosambri are missing. Why is it that everyday food gets neglected? Will post asap. These pictures I have taken in a hurry one in the kitchen as my dal boiled the other in the office will replace them. Radish slices added to this dal breaks the monotony of the everyday food. Wash and rinse the dal. Scrape the radish and wash it. Cut it in the desired shape and add to the dal. Add sufficient water and cook the dal in the cooker for 3 whistles. Remove from the cooker and mash the dal. Use the immersion mixer if you need. In a small copper-bottomed pan, heat the oil. Splutter the rai/mustard seeds; add the hing/asafoetida and the red chilli pieces. Add the haldi/turmeric, red chilli powder and the dal. Add water, rasam powder or sambhar powder, salt, jaggery and tamarind paste. 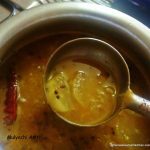 Sounds like a great dal to make and enjoy!..we have mostly made radish sambar, palya or even chutney…this dal version sounds good..btw amazed to read you made a pulao! 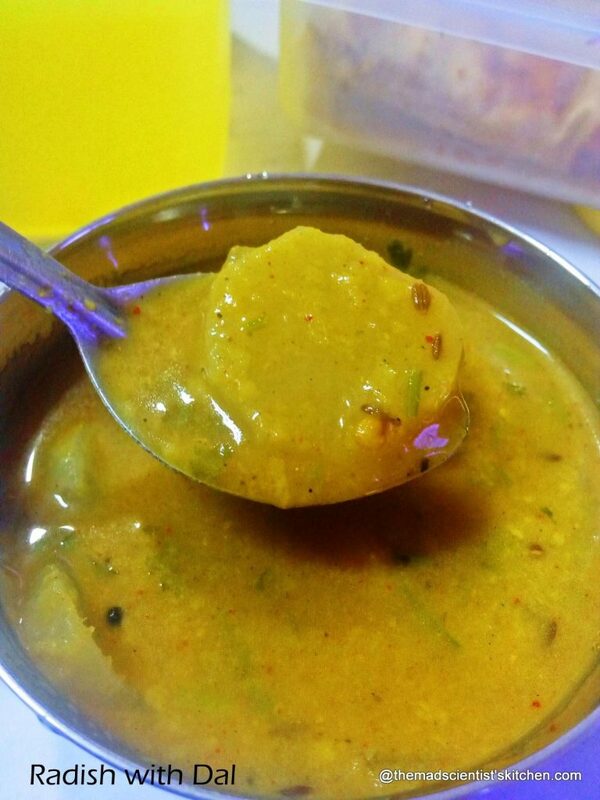 I love and more frequently prepared Radish Sambar and this radish dal looks interesting!! Except for using radish in salad and paratha , I don’t use it much in anything else . Addition to daal sounds fantastic , reminds me of some Himachal recipes where they use grated radish in curries . Radishes gives a strong flavour to any dish. Dal with radish must have tasted unique. Looks so much like mullangi sambar and this is the only way I can make my daughter eat radish. Best to be paired with rice. Delicious.. Simply love adding radish in dals, and the flavor of this dal will definitely makes you hungry. Lovely dal there. I only know of mooli ke parathe and mooli sabji. You’re right this dal is a great way to add the healthy mooli to one’s diet. At first, I thought its radish sambar. We usually make sambar with radish and shallots. This dal sounds yum and its a great addition to dals.